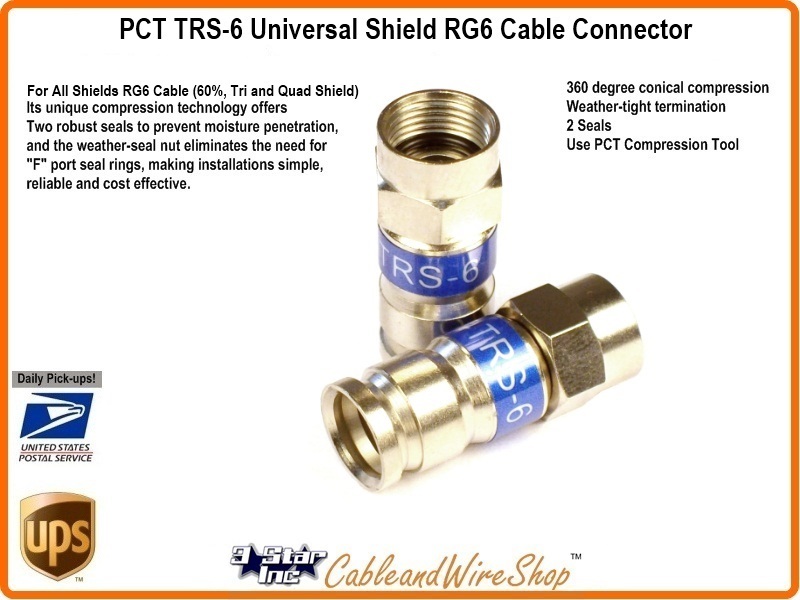 This Connector fits RG6 Cable with 60% thru Tri and Quad-Shield Braid Coverage. Its unique compression technology offers two robust seals to prevent moisture penetration, and the weatheseal nut eliminates the need for F port seal rings, making installations simple, reliable and cost effective. When used in conjunction with a standard seal ring, the weatheseal nut adds a robust second layer of protection against moisture migration. PCT's advanced post designgreatly reduces connector insertion force, making installation on all cable types a breeze, and the hex nut design ensures an easy-to-turn hex nut in all weather conditions. Several exterior plating materials are available to meet the needs of specific markets and/or protect against corrosion in even the harshest environments. Uses Compression Tool PCT-DRS-CT or PCT-AIO-CT Tools ONLY! As the Compression takes place in the Metal Rings and not through the use of Plastic! PCT certainly makes a Robust Connector, and we also encourage you to peruse the selection of Universal Connectors found in the same Category!